Mälaren (UK: /ˈmɛlərɛn/ MEL-ər-en, US: /ˈmeɪˌlɑːrən/ MAY-LAR-ən, Swedish: [²mɛːˌlarɛn] ( listen)), historically referred to as Lake Malar (UK: /ˈmeɪlər/ MAY-lər, US: /ˈmɛlɑːr/ MEL-ar) in English, is the third-largest freshwater lake in Sweden (after Vänern and Vättern). Its area is 1,140 km² and its greatest depth is 64 m. Mälaren spans 120 kilometers from east to west. The lake drains, from south-west to north-east, into the Baltic Sea through its natural outlets Norrström and Söderström (as it flows around Stadsholmen island) and through the artificial Södertälje Canal and Hammarbyleden waterway. The easternmost bay of Mälaren, in central Stockholm, is called Riddarfjärden. The lake is located in Svealand and bounded by the provinces of Uppland, Södermanland, Närke, and Västmanland. The two largest islands in Mälaren are Selaön (91 km²) and Svartsjölandet (79 km²). The Viking Age settlements Birka on the island of Björkö and Hovgården on the neighbouring island Adelsö have been an UNESCO World Heritage Site since 1993, as has Drottningholm Palace on the island of Lovön. 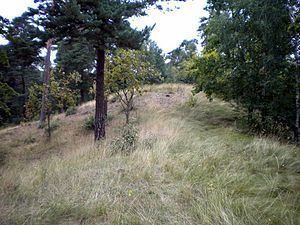 The barrow of Björn Ironside is on the island of Munsö, within the lake. Mälaren details, with Stockholm urban area to the right in pink. By the end of the last ice age about 11,000 years ago, much of northern Europe and North America was covered by ice sheets up to 3 km thick. At the end of the ice age when the glaciers retreated, the removal of the weight from the depressed land led to a post-glacial rebound. Initially the rebound was rapid, proceeding at about 7.5 cm/year. This phase lasted for about 2,000 years, and took place as the ice was being unloaded. Once deglaciation was complete, uplift slowed to about 2.5 cm/year, and decreased exponentially after that. Today, typical uplift rates are of the order of 1 cm/year or less, and studies suggest that rebound will continue for about another 10,000 years. The total uplift from the end of deglaciation can be up to 400 m.
In the Viking Age Mälaren was still a bay of the Baltic Sea, and seagoing vessels could sail up it far into the interior of Sweden. Birka was conveniently near the trade routes through the Södertälje Canal. Due to the post-glacial rebound, Södertälje canal and the mouth of Riddarfjärden bay had become so shallow by about the year 1200 that ships had to unload their cargoes near the entrances, and progressively the bay became a lake. The decline of Birka and the subsequent foundation of Stockholm at the choke point of Riddarfjärden were in part due to the post-glacial rebound changing the topography of the Mälaren basin. The lake's surface currently averages 0.7 meters above sea level. According to Norse mythology as contained in the thirteenth-century Icelandic work Prose Edda, the lake was created by the goddess Gefjon when she tricked Gylfi, the Swedish king of Gylfaginning. Gylfi promised Gefjon as much land as four oxen could plough in a day and a night, but she used oxen from the land of the giants, and moreover uprooted the land and dragged it into the sea, where it became the island of Zealand. Snorra Edda says that 'the inlets in the lake correspond to the headlands in Zealand'; since this is much more true of Lake Vänern, the myth was probably originally about Vänern, not Mälaren. The most common nesting birds on the skerries of Mälaren are also the most common in the Baltic Sea. After a survey in 2005, the ten most common species were found to be common tern, herring gull, black-headed gull, common gull, mallard, tufted duck, Canada goose, common goldeneye, lesser black-backed gull and common sandpiper. White-tailed eagle, greylag goose, barnacle goose, black-throated diver, red-breasted merganser and gadwall are less common, and some of these latter are endangered in the Mälaren area. Since 1994 a subspecies of great cormorant Phalacrocorax carbo sinensis, has nested there as well. A 2005 survey tallied 23 breeding colonies with 2178 nests, of which the largest colony had 235 nests. Most experts believe the great cormorant population has peaked and will stabilize at around 2000 nests. One of the characteristic species is the osprey which has one of its strongest presences in Lake Mälaren. The osprey nests in almost all bays of the lake. The Zebra mussel is considered an invasive species and is causing some problems in Lake Mälaren. Mälardrottningen (Lake Mälar Queen) is a poetic name for Stockholm well known in Swedish literature. Utter Inn, an underwater hotel designed by the artist Mikael Genberg, is in the lake. The area around the lake hosted the cycling events at the 1912 Summer Olympics. ^ "Mälaren". The American Heritage Dictionary of the English Language (5th ed.). Boston: Houghton Mifflin Harcourt. 2014. Retrieved April 14, 2019. ^ "Mälaren" (US) and "Mälaren". Oxford Dictionaries. Oxford University Press. Retrieved April 14, 2019. ^ "Mälaren". Merriam-Webster Dictionary. Retrieved April 14, 2019. ^ "Mälar". Collins English Dictionary. HarperCollins. Retrieved April 14, 2019. ^ ”Mälaren”. Nationalencyklopedin. Accessed 4 November 2016. ^ Friman, Helena, Söderström, Göran. (2008). Stockholm: en historia i kartor och bilder. ^ Anthony Faulkes (ed. and trans), Snorri Sturluson: Edda (London: Everyman, 1987), p. 7. ^ Heimir Pálsson, 'Tertium vero datur: A study of the text of DG 11 4to', p. 44 http://urn.kb.se/resolve?urn=urn:nbn:se:uu:diva-126249. ^ 1912 Summer Olympics official report. p. 224. Wikimedia Commons has media related to Mälaren. Wikisource has the text of the 1879 American Cyclopædia article Mælar.